As we did some pre-Christmas beer shopping, Colleen spied a bottle of St. Bernardus Christmas Ale on the shelf. 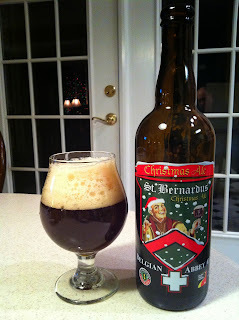 Since this one was absent from her St. Bernardus flight the other evening, Colleen suggested we pick it up for our Christmas celebrations. That's certainly a suggestion to which I cannot object. We opened the bottle on Christmas evening after dinner. This seasonal Quadrupel-style from the Belgian brewery is dark red and cloudy in appearance. It reminded me of a dark mulled cider, though with a thick, frothy beige head. The foam dropped fairly quickly, leaving behind a very sticky lacing on the inside of the glass. The aroma was fruity and slightly sweet, with a hint of yeast. The flavor is that of dark fruit, with cherry and plum dominating. There is a slight tartness that comes through in the end. The mouthfeel is thin, and although the carbonation in minimal, there is a lively effervescence to tingle the tongue. We sipped our Christmas Ale late into the evening, as the family enjoyed a movie. Still being quite full after a wonderful Christmas feast, there was no room for more food to go along with the beer. Despite the rich dark appearance and flavors, the beer was actually quite light and easy to enjoy.